Memorial Day in the United States usually sparks the beginning of the “BBQ season” throughout the country. Parades were on display, families spent much-needed quality time together and glorious BBQ’s were grilled to perfection. We kept our BBQ simple. No homemade sauces, no 2 day marinades, no ribs, no 10-hour smoked pork or award-winning spice rubs. Just an easy and simple gathering of food, charcoal and people to ring in the festive warm weather and great outdoors. However, do not be fooled by the simplicity displayed here. When it is time to throw down on some major BBQ, Smooth Vintage knows how to make your grill skills the talk of the neighborhood. Every smooth person should know how to put together a BBQ without creating a disaster (to yourself or others). 1.) Relax on the lighter fluid. Actually, don’t even use the stuff. The worst, absolutely worst thing that can happen to a BBQ, next to undercooking the food, is having ALL the food taste as if it was marinated in lighter fluid. We’ve all been to a cookout, BBQ hosted by a friend, family member or whoever that is a tad heavy-handed when it comes to that lighter fluid. I’m talking about a good dousing of the stuff on the charcoal, a torrential rain of lighter fluid. Don’t be that person. There are many alternative methods to sparking up your grill rather than using lighter fluid. A mix of wood chips soaked in water and added to charcoal is one of the best options to go with. It’s safer than lighter fluid and you can experiment with different wood chips to see which flavors work best for the food on your grill. Chimney starters are a fantastic grill lighting accessory and will aid in your road to BBQ glory. Just place newspaper underneath the starter and charcoal on the inside and you are good to go within minutes. Remember humans have been staring fires for thousands of years and didn’t need lighter fluid then. Why should you? 2.) Navigate the hot spots of your grill. It may sound strange but yes your grill has varying degrees of heat once the charcoal is ready for use. The closer you are towards the center the more heat you’ll have and depending on what you are grilling you may not want too much heat to start out with. 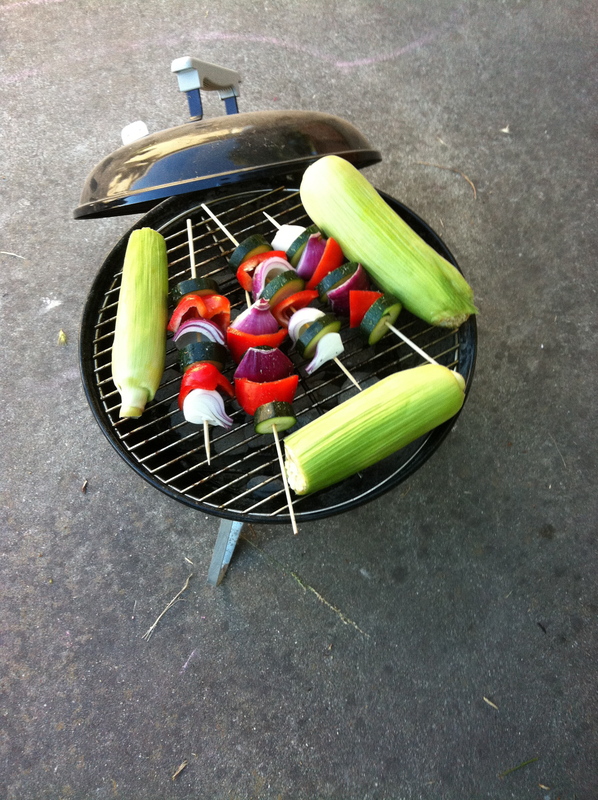 Vegetable kabobs don’t need much grill time, you can place them in the center for a brief period and then reposition them towards the outer sections of the grill. If you want to experiment with coal placement you can move the coals to the outer edges of the grill and leave the center open. Place a drip pan in the open area and grill your food as normal. This method (indirect) cooks the items on the grill at a slower pace and won’t sear your food as it cooks. 3.) Thermometers are your friend. Most of us just “guesstimate” as to when our grilled food has reached a suitable level for all to eat and enjoy. Some wait until the chicken has clear juices, the burgers don’t ooze out too much or the corn has that ready smell. By all means if you’ve been grilling for a while and that works more power to you. However, being 100% sure the food is done with a thermometer sure beats out a night of food poisoning because your guesstimate was off a few degrees. The best world-class grill masters have no shame in using a thermometer and neither should you. 4.) Rotate, rotate, rotate. That is pretty self-explanatory. Keeping an eye on your food and rotating it ever so often will maximize the heat and provide an overall taste to the food. However don’t overdo it because too much rotation will not give enough time for the heat to do its job. 5.) Rest your food. The best flavors come together after they’ve had a chance to simmer and settle in once the heat has turned off. You can eat your grilled delicacies once you’ve immediately taken them off the grill but you’ve robbed yourself of a unique taste experience. Lasagna ALWAYS tastes better the next day it has been prepared, soup and chilis seem to taste more vibrant after they’ve mellowed out after the cooking has finished. Same concept to consider when you have finished grilling your foods. After cooking, place the food in an aluminum tray and cover the tray sith foil or just wrap up the food in foil for 5 – 10 minutes. Guaranteed the meats will be even more delicious afterwards. More to come as the summer progresses and don’t be afraid to experiment with different styles of BBQ, sauces, wood chips and charcoal. Keep the grill sparking.